COLUMBUS — Nearly 9,000 bicycle helmets will be going to children across Ohio this spring, thanks to the Put A Lid On It! campaign, a continued partnership between the Ohio Department of Transportation and the Ohio Chapter of the American Academy of Pediatrics. 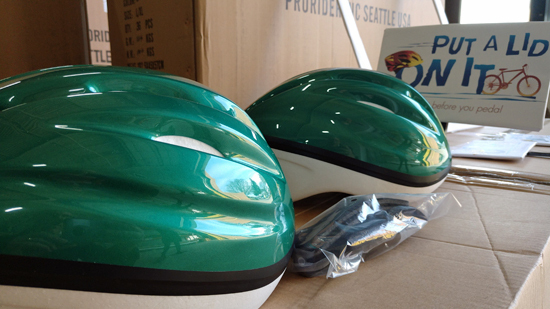 ODOT contributed approximately 6,500 of the helmets. Thanks in part to a $12,000 grant from Honda of America Marysville, the helmets will be provided at no cost to children across Ohio to keep them safe while enjoying a bicycle ride. While bicycle-related fatalities only represent 4 percent of roadway fatalities, they are on the rise statewide. Between 2009-2018, 182 Ohioans were killed while riding a bicycle, a 22 percent increase. Twelve percent of bicycle-related fatalities in the last five years were children between the ages of 5 to 14. To learn more about Bike Helmet Safety Awareness Week, visit the Put A Lid On It page at the Ohio AAP’s website at www.ohioaap.org/putalidonit. To learn more about the Ohio Safe Routes to School program visit: walk.ohio.gov.